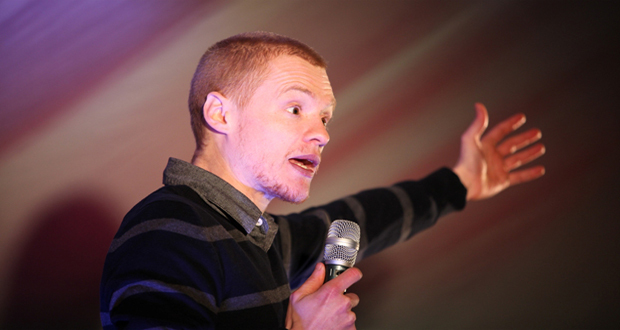 Andrew Lawrence is known for his downbeat delivery and impassive attitude to his audiences, but tonight’s performance of Reasons To Kill Yourself takes that to a new level. His opening gambit is to apologise for his sore throat, explaining that he has been retching at five-star reviews of less skilled comedians. The show starts positively, as Lawrence explains its title, riffing on offence and people’s attitude to jokes surrounding human life. He then attacks the rise of feminism on the stand-up circuit, in surprisingly the first routine to produce some real belly-laughs in the room. He rips into a few latecomers who sneak into the back of the room, and one who makes a target of herself by arriving late to a front-row seat. Unfortunately this happens a few times within the first 20 minutes and, although dealing with it very well, Lawrence is clearly knocked off his stride a little. Reasons To Kill Yourself revolves around the downward trajectory of Lawrence’s career, a path he seems to blame the audience for, and his comparison of that to the success of his peers. While this bitterness is genuinely hilarious in parts, as he uses his trademark monotone delivery to great effect in extended rants, it eventually becomes more sinister. Lawrence explains that he has become jaded with the industry, jaded with TV writing, jaded with playing small clubs and jaded with the success of others. He even turns on tonight’s audience, denying full responsibility for the largely lukewarm response and blaming the room, the venue, and the small numbers, despite this being a sell-out show. As Lawrence brings the pace down, along with the mood, towards the end of the set, it is clear that he needs one hell of an upswing to end on a high. Although there are some heartwarming revelations it’s not quite enough to pull the audience back onside. A few comedians have joked about standup effectively being their therapy, but this show really demonstrates that in action. Despite some very funny routines, and undeniable skill, watching a comedian fall out of love with the art onstage simply isn’t very funny.